Skillet Eggplant Lasagna: A super cheesy and comforting one-pot vegetarian pasta recipe that’s incredibly easy to make on a weeknight! How do you cook 4 vegetarian dinners per week and have none of them ever include tofu? 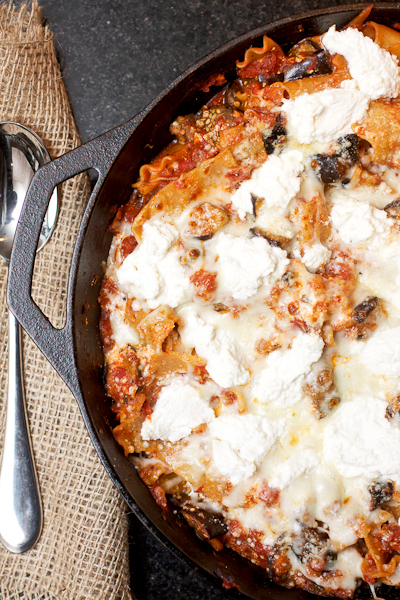 This skillet eggplant lasagna is one of my answers, my friends! Last fall we made the decision to eat less meat for a variety of reasons (health, cost, carbon footprint) and to my surprise when I took a critical look at our menus from the past few weeks recently, I realized that more than half of our dinners have been vegetarian each week. And I think what shocks me the most is that Kyle is no longer asking where the meat is in his meals! That’s craziness here! We’ve been eating lots of quinoa and incorporating more beans as protein substitutes and boosting our vegetable intake by eating meals centered on portobello mushrooms and eggplant. So it hasn’t been a diet of salads and I couldn’t be happier! This recipe is one that I adapted to a veggie version by simply swapping out the ground beef, a traditional ingredient in lasagna, for eggplant. Since eggplant can be a tricky vegetable to work with due to its high water content, I took the method from this eggplant pasta recipe (which we also loved) and used it for this recipe. Making this skillet lasagna with eggplant instead of beef added a little extra to the overall cooking time but the method works great since sauteing cubed raw eggplant can take forever and oftentimes results in a mushy mass. And while I wouldn’t categorize this as a healthy vegetarian recipe (what lasagna recipe is healthy? ), plain and simple, it’s awesome! 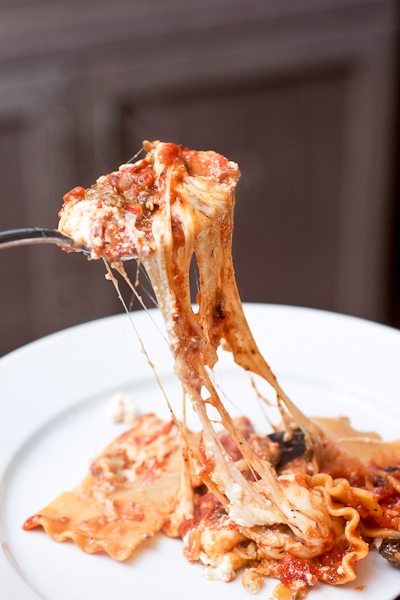 But let me lament about a few other reasons why I loved this skillet eggplant lasagna so much. 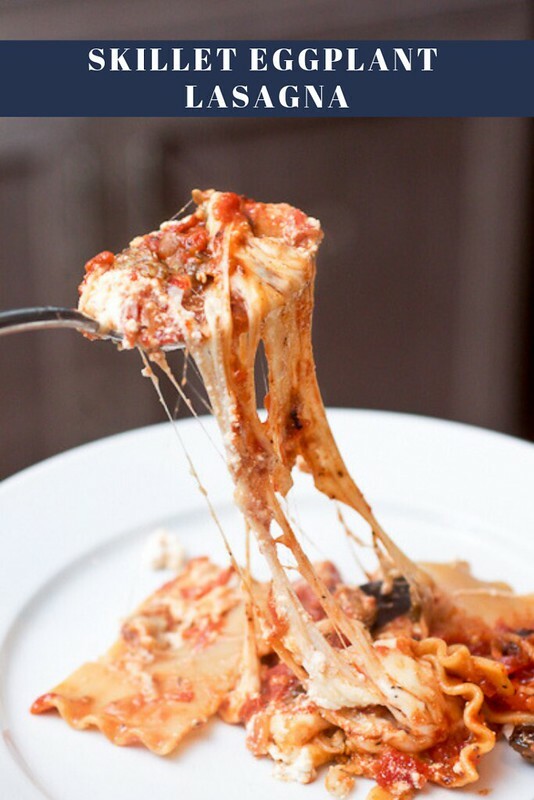 First, using broken-up noodles gives you the chance to forgo all the laying that happens with a traditional lasagna which cuts down on some of the frustration that comes with stacking layers. This is also only of the reasons why I love these three cheese lasagna rolls-ups so much!! And since this is a one pot meal using just a few dishes, clean-up isn’t a disaster. The fact that this skillet eggplant lasagna is loaded with mozzarella, ricotta, and Parmesan cheeses certainly doesn’t hurt either. It’s a warm and hearty meal for the chilly and rainy fall days we’ve been having recently but I can certainly see this meal happening throughout the winter as well. We loved the fact that this was a comforting vegetarian pasta recipe but if you’re looking for something a little meatier, you need to try my one-pot creamy sausage pasta. It’s crazy delicious and it’s perfect for a quick weeknight meal! I found that I needed a considerable amount of water to properly cook the noodles in this recipe – as much as 2 cups. I suspect it may have been because I didn’t puree my tomatoes enough, leaving them rather chunky and the sauce thick, so I’d suggest keeping some water handy, just in case. If you find that the noodles are sticking to the bottom of the pan and the sauce is too thick to properly cook the noodles, mix in a little of the water each time you stir the pasta. Line a large plate or large and very shallow serving bowl with a double layer of paper towels. Place the eggplant in a large bowl and sprinkle 1 teaspoon of salt evenly over the eggplant; toss to coat well. Spread the salted eggplant out in an even layer on the plate. Microwave uncovered, about 10 minutes, tossing halfway through. When finished, the eggplant should be dry and starting to shrivel. Heat 2 tablespoon of the oil in a 12-inch ovensafe skillet over medium-high heat. Add the eggplant and cook until well browned and tender, about 10 minutes, stirring occasionally and scraping the bottom of the pan as needed with a wooden spoon. Return the eggplant to the bowl. While the eggplant cooks, puree the tomatoes in the food processor until a few small chunks remain and the tomatoes are mostly smooth. Return the skillet to medium heat and heat the remaining oil. Add the onion, ½ teaspoon of salt and ¼ tsp pepper and cook, stirring often until softened, about 5 to 7 minutes. Stir in the garlic, pepper flakes, and Italian seasoning and cook until fragrant, about 30 seconds. Scatter the broken pasta over the onions, then pour the tomato sauce over the top. Stir to combine the ingredients, increase the heat to medium-high, and cover. (If you don’t have a cover for your 12-inch pan like me, a large baking sheet will do the trick.) Cook at a vigorous simmer, stirring often, until the pasta is tender, 20-23 minutes. Add water if needed when you stir – see head note above. If you don’t stir the mixture or add water if it’s too dry, the pasta will clump together and stick to the bottom and sides of the skillet, likely burning the pasta if you don’t pay attention. Preheat the broiler during the last few minutes that the noodles cook. Remove the skillet from heat, and stir in the eggplant, 2/3 cup of the mozzarella, 1/4 cup of the Parmesan, and 1/4 cup of the ricotta. Sprinkle the remaining mozzarella and Parmesan over the noodles then dot the top with the remaining ricotta in tablespoons. Transfer to the oven and broil until the cheese melts and is starting to brown. Remove from oven, sprinkle with basil (if using), and serve hot. My hubby and I are trying to incorporate more turkey, chicken and veggies into our meals and have red meat only a few times a week (mostly weekends..). This is inspiring to me as I am thinking I can do this recipe with mushrooms as I don’t care for eggplant. Thank you for sharing and helping spur me on to this. It hasn’t been bad so far and if I can get rid of some of the poultry a few nights a week that will be great. I love the idea of using eggplant to make it vegetarian! I’ll definitely be trying this version soon! We don’t microwave in our house- how long would you recommend to dry out the eggplant in a toaster oven? I don’t really know. I’ve never tried to dry out eggplant in an oven or toaster oven so you may have to use a little trial and error. Pop the sliced eggplant in the toaster oven for roughly twenty minutes, flipping them halfway through–it works like a charm! you never mention putting the eggplant back in the skillet. i assume you put it in with the tomato sauce? Thanks for catching that – you’ll add it with the cheeses at the end. Because the eggplant is already fully cooked when you finish sauteing it, you don’t want to keep cooking it with the noodles and sauce. I’ve updated the recipe. Thank you for this recipe! I made this for dinner for last night and it was MARVELOUS! This will make its way into regular rotation at our house.